Tsozum Tours,Treks & Expeditions offers attractive discounts to Student groups and Group bookings. Arrival in Bagdogra, a small town at the foot of the hills of the Himalayan foothills. Transfer by private vehicle to Pelling. Nearly a third of the journey takes place on a magnificent and winding along the river Teesta and river Rangeet (Two major rivers of Sikkim). Transfer to hotel. Overnight at hotel. After an early breakfast visit the magnificent monastery of Pemayangtse (1705 BC). 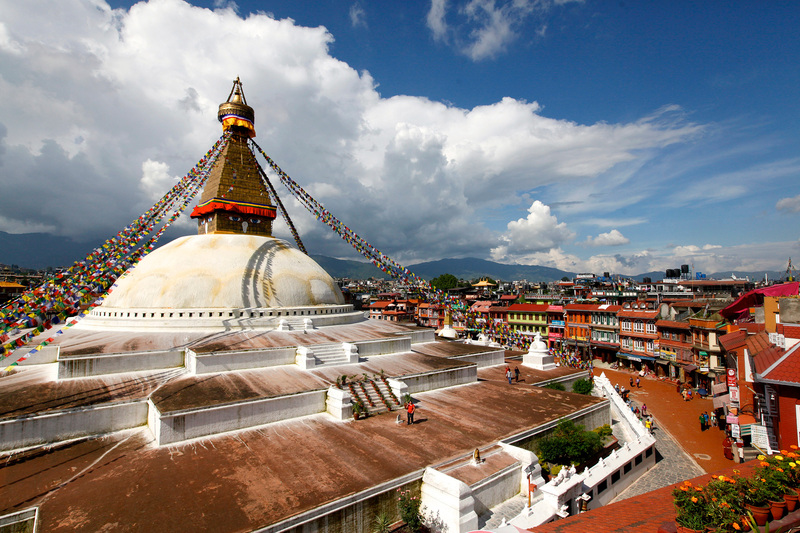 It is the heart of Buddhist activities in Sikkim and runs all the monasteries of the Nyingmapa school (red hat sect). 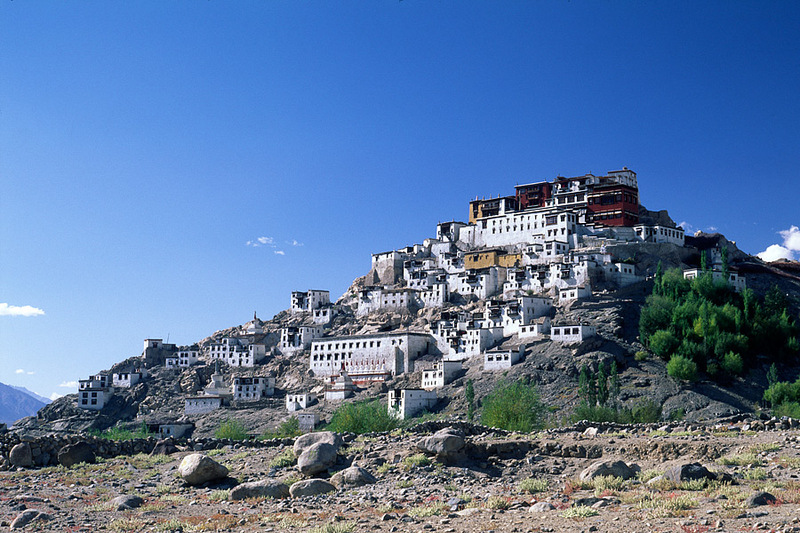 Built on top of a hill, it is one of the oldest monasteries in Sikkim. 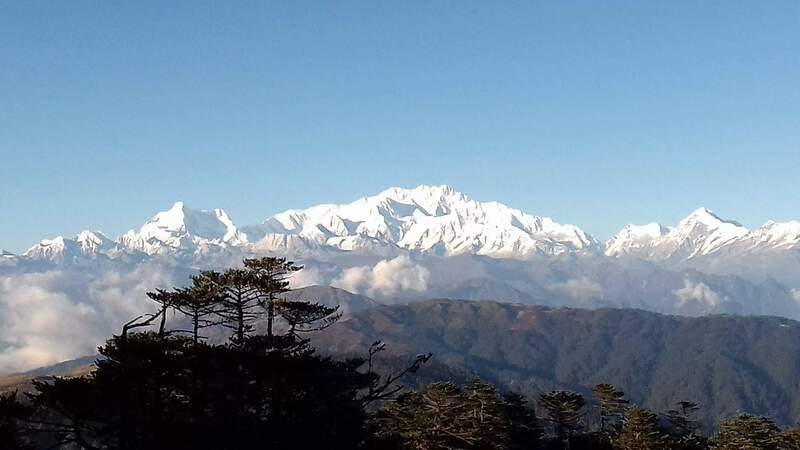 From here, the panorama view of the Kangchenjunga is mangnificent. Near the monastery, visit the site of Rabdentse, second capital of the ancient kingdom of Sikkim from 1670 to 1814. Continue drive to Rimbi. From Rimbi, departure on foot following a good path that gradually rises in the middle of the plantations of cardamom and other cultivated fields. We walk along the Rimbi Khola river and climb towards the charming village of Sengkhola. Overnight camp. Morning departure from the camp. The day starts with a crossing of the Rimbi khola river by a bamboo bridge and then climbs to the village of Chongri (2,186 m). From this small village, we follow a path through the luxuriant vegetation to reach Chuzom, the confluence of the Shying Khola and Doban Khola rivers (which then form the Rimbi Khola). Lunch break. Then we go up the Shying Khola. We pass on the other side of the river for a steep ascent to Nayapatal. Installation of the camp in a small clearing in the middle of the forest, near a military camp. Nayapatal - Rato Pani (3,270 m) 4 to 5 hours trek. Climb into the pine and rhododendron forest to the Bik Chok camp (2,709 m). Continue the ascent to another camp, Saili Chok (2 963 m). As we climb up the ridges, the view becomes spectacular. Installation of the camp on a beautiful site, at the edge of a creek. Superb view over the valleys. Overnight in tents. A calmer day today to facilitate acclimatization. Climb the gentle slope through the pine forest towards the ridge of Sigalila. Crossing a camp at Lower Yambong (3,436 m), located in the heart of a lush forest. Continue the ascent to Upper Yambong on a path gradually emerging from the dense vegetation observed until then. Arrival at the Upper Yambong balcony camp. Installation near a shepherd's hut, where you sometimes meet flocks of yaks and dzos. In the afternoon, for those who wish, explore on foot of the surroundings. Progressive and steep ascent to Lam Pokhari. The course is traced through a sparse vegetation of rhododendrons. As you climb, the view opens up into the mountain range. We reach the main ridge a little below Lam Pokhari, after having passed along the lake of Garaketh Pokhari. Continue walking along an ancient path to reach the camp at Lam Pokhari, surrounded by sacred lakes, emblematic pilgrimage places for the inhabitants of Sikkim during the monsoon period. In fine weather, the day ends with a spectacular sunset over Makalu and other high summits. Danphe Bir to Yangseb: 6 to 7 hours trek. Early departure for the Danphe Bir pass to admire the landscape under a morning light. We take a zigzag trail from where we see the pass Danphe Bir in the distance. After a first pass and a short descent, climb to the Danphe Bir pass (4,500 m), marked by hundreds of prayer flags. Magnificent panorama to the "8,000" of the Everest region. Descend by a path into a balcony, then through a forest of pines and junipers to the river at Gomathang, then climb to the camp at Yangseb. Overnight at camp. Contour of the hillside by a path alternating ascents and descents, then crossing a small river to make a last climb of a pass at 4 310 meters. Beautiful panorama on the slopes of the mountains. Continue hiking to Panding (4,275 m), where we set up tents for the night. Descent to the Bikbari river (approx. 2 hours walk). As time goes by, the forest of rhododendrons becomes denser. Crossing the river then gently sloping up a small pass leading to the vast meadows of Chaurikhang and Dzongri. Overnight at camp. Morning departure to admire the sunrise from a belvedere about half an hour from the camp. We take a charming path dotted with prayer flags. Magnificent view of the Kangchenjunga and its neighboring peaks of Rathong (6,683 m), Kabru Dome (6,604 m) and Forked Peak (6,116 m). The walking stage begins with the short ascent of a ridge. We follow this panoramic ridge for five kilometers before descending by a steep hill to the Praig Chu River. Crossing the river, then climbing towards Thangsing, a large verdant mountain pasture dominated by the southern edge of the Kangchenjunga and the moraines of the glacier Onglaktang. Lunch in Thangsing . Rest. Overnight at camp. 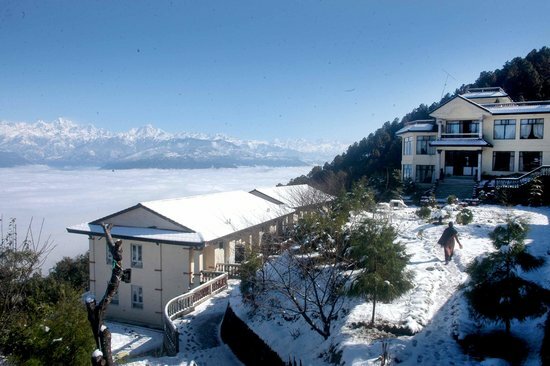 A pleasant walk with a constantly striking view of the Kangchenjunga which rises majestically facing us. Overnight at camp. Departure very early (around 3 am). The climb is a little tiring, but the reward are there, after three hours of effort, exceptional! The Onglathang glacier and its lake are magnificent as are the 4,000 meters of the southeast face of the Khangchendzonga and its suspended glacier. The most fit can climb up to the Gocha Pass where the view is even more imposing. On the way back you have to walk to the sumptuous lake of Samiti and the great mountain pasture of Thangsing (1 h 30). Today we retrace our steps to the river where we take another path, passing by Phedang, a small clearing in the middle of the forest. We descend through a lush forest, magnolias and giant rhododendrons, to the tiny hamlet of Tsokha. Overnight at camp. Continue the descent through the rhododendron forest to the suspension bridge overlooking the Praig chu. From there we take a wavy path to the big village of Yuksom. Yuksom is an emblematic place in the history of Sikkim, for the first king was crowned there and his throne is still there. You can walk to Dubdi Monastery, the first monastery of Sikkim perched on a hilltop over looking Yuksom village. Transfer to your hotel. After an early breakfast drive to Bagdogra airport for onward journey.